The expansion is being driven by the Indonesian government’s push for export revenues and demand for the crop from the international food and cosmetics industries. Palm oil is also in demand in European countries and elsewhere as an alternative to fossil fuels, despite the growing amount of evidence which shows that palm oil is far from green in terms of climate change. In Indonesia, palm oil is being presented as an answer to poverty and unemployment. However the reality in the field shows otherwise. Working with local NGO, Elang, Down to Earth visited Paya Rumbai village in Riau province to investigate the life of a village surrounded by palm oil plantations. The result of this investigation is our new report – Plantations and Poverty: Notes from a Village Deep in Oil Palm Territory – available in both English and Indonesian. Plantations and Poverty shows how the Paya Rumbai villagers’ lives have been hemmed in by the oil palm companies. The prosperity which was promised in exchange for giving up their land has not materialised. Instead the villagers are lucky to get work as day labourers on the plantations. Meanwhile the village’s natural resource base is dwindling fast as palm oil plantations take over more and more land and income from logging and fishing declines steeply. Plantations and Poverty adds to the growing store of information about the village-level impacts of the international trade in oil palm. 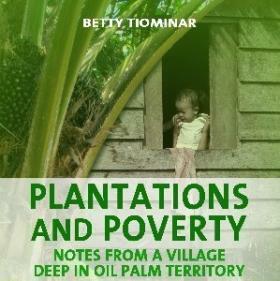 The book reaffirms that oil palm does not solve the problem of poverty and unemployment in Indonesia. Instead it leads to increased landlessness for poorer villagers and greater inequality between rich and poor; it brings low-paid, insecure jobs with inadequate health and safety provision; it means more pressure on land and on the village’s remnant forests, as local people turn to logging to try to make a living. The Paya Rumbai case shows that current plans to convert millions more hectares of Indonesia’s forest and farmland into oil palm plantations need an urgent rethink.